This class defines an abstract interface for the SQLStatement class. Returns True if the object is currently active and has a connection or transaction lock allocated to it, or False if not. If the statement has not previously been prepared with the DB API, it will be implicitly prepared by this method call. This means that this call will cause a connection to be dedicated from a DatasourcePool object or the transaction lock to be grabbed with a Datasource object, depending on the argument to AbstractSQLStatement::constructor(). Arguments to buffer specifications must be given in the same order as declared in the string given to the AbstractSQLStatement::prepare() method. Any arguments previously bound will be released when this call is made. You can also bind directly when calling AbstractSQLStatement::exec() or AbstractSQLStatement::execArgs() as a shortcut as well, in which case it's not necessary to make an extra call to this method. Arguments to buffer specifications must be given in the same order as declared in the string given to the AbstractSQLStatement::prepare() method. Only placeholder buffer specifications will be processed; value buffer specifications will be skipped by this method. Any buffer specifications previously defined will be released when this call is made. You can also bind buffer specifications directly when calling AbstractSQLStatement::exec() or AbstractSQLStatement::execArgs() as a shortcut as well, in which case it's not necessary to make an extra call to this method. Not all DBI drivers require binding placeholders specification. Any values previously bound will be released when this call is made. AbstractSQLStatement::bind(), AbstractSQLStatement::bindArgs(), AbstractSQLStatement::bindPlaceholders(), AbstractSQLStatement::bindPlaceholdersArgs(), and AbstractSQLStatement::bindValuesArgs(). Closes the statement if it is open, however this method does not release the connection or transaction lock. Commits the transaction, releases the connection or the transaction lock according to the object used in the AbstractSQLStatement::constructor(), and closes the SQLStatement. Returns True if the current thread is in a transaction (i.e. holds the transaction lock), False if not. Performs an explicit define operation on the SQLStatement. Describes columns in the statement result. Executes the bound statement with any bound buffers, also optionally allows binding placeholder buffer specifications and values to buffers defined in AbstractSQLStatement::prepare() before executing the statement. Optional arguments to buffer specifications must be given in the same order as declared in the string given to the AbstractSQLStatement::prepare() method. If bind arguments are provided, any arguments previously bound will be released when this call is made. After calling this method to execute the statement, to retrieve information about the call or output values bound in the call, call AbstractSQLStatement::affectedRows(), AbstractSQLStatement::getOutput(), or AbstractSQLStatement::getOutputRows() as needed. To retrieve rows from a select statement call either AbstractSQLStatement::next() and AbstractSQLStatement::fetchRow(), or AbstractSQLStatement::fetchRows() or AbstractSQLStatement::fetchColumns() as needed. Retrieves a block of rows as a hash of lists with the maximum number of rows determined by the argument passed; automatically advances the row pointer; with this call it is not necessary to call AbstractSQLStatement::next(). If the argument passed is omitted or less than or equal to zero, then all available rows from the current row position are retrieved, also if fewer rows are available than requested then only the rows available are retrieved. Retrieves the current row as a hash where the keys are the column names and the values are the column values. If no more rows are available then an empty list is returned. Retrieves output buffers as a hash; result sets will be returned as hashes of lists. Retrieves output buffers as a hash; result sets will be returned as lists of hashes. Returns the current SQL string set with the call to AbstractSQLStatement::prepare() or AbstractSQLStatement::prepareRaw() or NOTHING if no SQL has been set. Increments the row pointer when retrieving rows from a select statement; returns True if there is a row to retrieve, False if not. Saves an SQL statement that will be prepared and executed later, along with optional arguments. The statement is actually only prepared when used for the first time, this is so that SQLStatement objects created with DatasourcePool objects use the DatasourcePool more efficiently, as many drivers require the actual DB API prepare call to be made on the same connection as the connection the statement will be executed on as well. This method parses the SQL string for placeholders and bind by value tokens (%v); for a version of this method that does not parse the SQL string for placeholders and bind by value tokens, see AbstractSQLStatement::prepareRaw(). Saves an SQL statement that will be prepared and executed later. This method does not parse the SQL string for placeholders and bind by value tokens (%v); for a version of this method that does parse the SQL string for placeholders and bind by value tokens, see AbstractSQLStatement::prepare(). 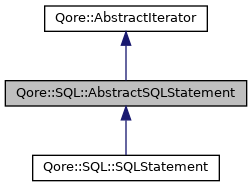 Closes the SQLStatement, performs a transaction rollback, and releases the connection or the transaction lock according to the object used in the AbstractSQLStatement::constructor(), and closes the SQLStatement.